Scott Planting, a St. Louis native, has known his path in life has been to help those in need since early in his career. A Harvard graduate, but not one to brag about it, Planting worked in Farmington for a short while in graduate school and immediately felt connected to the people of the small town. Coming from St. Louis and studying in Boston, he made his career helping small communities in Maine and joined us today to talk about his work at Maine Seacoast Mission and how Maine’s economics have led to the downfall of some of these communities. 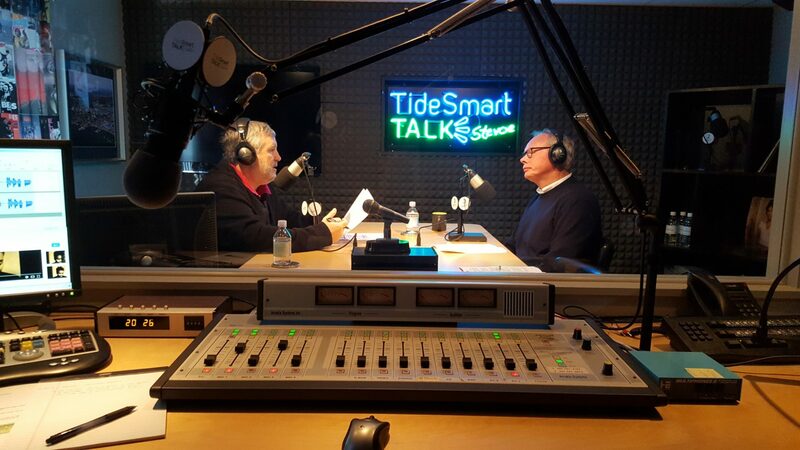 Host of TideSmart Talk with Stevoe, Steve Woods, welcomed Scott Planting, President of Maine Seacoast Mission (at right). Coming from an academic family and upbringing, Planting first experienced the “small-town” culture working with farmers in the midwest as a young adult. After graduating with a Masters of Divinity from Harvard University, Planting rooted himself in Maine. He was a Parish Minister for 35 years in Farmington and the Executive Director of the Mission at the Eastward for a large part of that time as well. In 2010, Planting assumed the position as President of the Maine Seacoast Mission (MSCM), based in Bar Harbor, and has been helping children, families, and all those in need from the region. Per their website, the Mission provides “spiritual, health, and youth development programs in coastal and island communities from mid-coast to Downeast Maine.” Planting says the Mission is best known for their steel-hulled ship, Sunbeam V. The MSCM, founded in 1905, has consistently served Maine’s Outer Islands by boat. They provide a telemedicine service, a salon, and spaces for meals and worship in the communities of Cliff, Frenchboro, Isle au Haut, the Cranberry Islands, Matinicus, and Monhegan. Planting also spoke of the Mission’s EdGE program (Ed Greaves Education). Among other things,EdGE is an after-school program in nine area towns for children Pre-K through high school. They offer childcare, but also try to make the students feel valued and important. Recently, EdGE sent several older children to Boston on a bus to explore the city on their own and offered them tickets to a Boston Bruins game that evening. The Mission (and EdGE) tries to give the children a sense of the world that due to what Planting calls an “opportunity gap,” they would normally not experience. The Mission also offers scholarship program to students who wish to earn a college degree. For more information about Maine Seacoast Mission, please visit their website at SeacoastMission.org, visit them on Facebook at facebook.com/MSCMWelcome, or listen to the interview below. Posted on Thursday, November 10th, 2016 and filed under Show Recaps.